U.S. Rep. Kevin Brady left the GOP baseball practice early Wednesday morning, declining an offer to catch some grounders from second base. U.S. House Majority Whip Steve Scalise was in that spot instead, when a gunman appeared and shot him. WASHINGTON, D.C. – U.S. Rep. Kevin Brady was not even on the field when a shooter opened fire on his colleagues Wednesday morning, but the event will probably haunt the Woodlands Republican for the rest of his life. Brady is the designated hitter for the Republican Congressional baseball team. He said he has that slot because his roommate, U.S. House Majority Whip Steve Scalise of Louisana, beat him out for second base. On Wednesday morning, as Brady took batting practice, the team's coach, U.S. Rep. Roger Williams – a fellow Texan – offered Brady the chance to take some grounders at second base as the team's back up. "I looked out at second base, where Steve and I play. I thought for a moment," Brady recounted on Wednesday afternoon. "I told Roger, 'Nah, I'm fine.'" Brady said he then picked up his gear and left the field, leaving Scalise at second base. "That was apparently a couple of minutes before the shooting," he said. Scalise went down just after Williams sent his first grounder toward second base. Scalise was the lone Congressman shot, along with two Capitol Police officers and a Williams staffer named Zack Barth, who was released from the hospital later in the day. Brady spent the day at the hospital with Scalise and their two other roommates who also play on the team: U.S. Reps. John Shimkus of Illinois and Erik Paulsen of Minnesota. 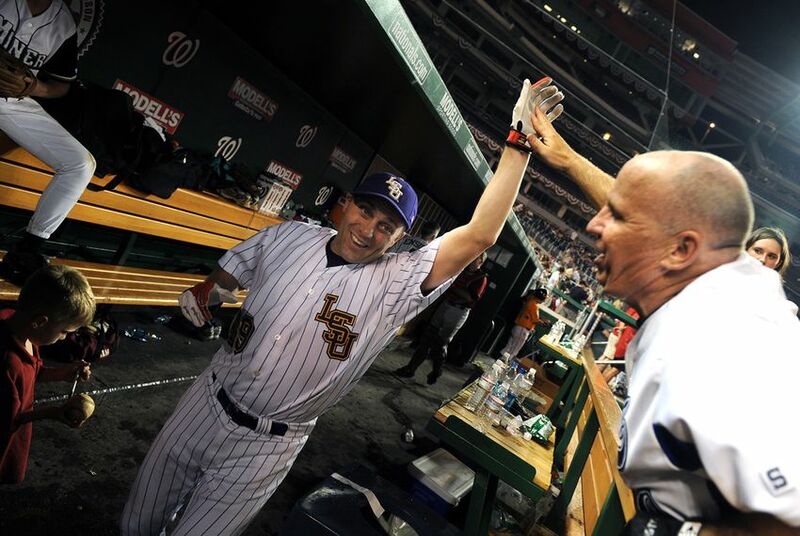 "It pains me to say this, coming from Texas, but Scalise is not just my close friend, but he’s a proud LSU tiger," Brady said. "So he’s tough as nails and we are all praying for his recovery." According to various news reports, Scalise dragged himself to a safer position as the mayhem continued around him at the suburban Virginia practice facility. Williams dove into the first base dugout. There, Williams and Zack Barth, a staffer of his who had been shot, clung to each other while U.S. Sen. Jeff Flake of Arizona staunched Barth's bleeding with his baseball belt. Barton said Williams also aimed to protect other teammates in the dugout as well as Barton's young son. U.S Rep. Chuck Fleischmann of Tennessee screamed out the emergency call to 911, per Williams. "It seem like it went forever," Williams later recounted. "We had no arms. All we had were bats." The shooter was eventually fatally shot. Everyone else on the scene survived. Brady, like Williams, credits two factors: a locked gate that prevented the shooter from getting on the field, and thereby having a clear shot at players congregated near first base, and the valor of the U.S. Capitol Police force on the scene. "The thin blue line held," Williams said tearfully at a news conference later that day where he was on crutches. But Brady added another chilling piece of luck: The team's pitchers skipped Wednesday's practice to avoid wearing out or injuring their arms ahead of Thursday night's big game. "On any other given day, our pitchers would have been throwing in the bullpen right where the shooter appeared," Brady said. "They would have been trapped, but they’re all resting their arms." As Washington became consumed in a debate about whether the shooter had been motivated by partisan rhetoric, Barton, the GOP team manager, presented a united force Wednesday afternoon with the Democratic coach, U.S. Rep. Mike Doyle of Pennsylvania. At a news conference, the pair stressed the humanizing impact of baseball, and the newfound importance of Thursday's game's at such a toxic moment in American politics. Doyle then made a gesture to emphasize that point. Besides baseball, members of the two parties do not normally socialize much. Even after the annual game, the two teams head to one of two haunts on the House side of Capitol Hill: the Democratic Club for the Democrats and the Capitol Hill Club for the Republicans. But this year will be different. On Wednesday night, the eve of Thursday's game, Doyle announced that the Democratic team had invited the GOP team to dinner at their club. When informed about the Democratic dinner invitation late Wednesday afternoon, Brady, who was still at the hospital waiting for more news on his roommate, went quiet for a moment. Then he finally spoke: "I’ll be darned. That’s good."